Originally published under the title "Turkey: The Purges Continue." 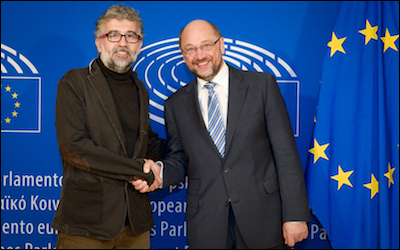 Erol Onderoglu (left, meeting with European Parliament President Martin Schulz), the Turkey representative for Reporters Without Borders, was recently arrested with two others for "aiding terrorists" after they guest-edited a pro-Kurdish newspaper when its editors were jailed. Philipp Schwartz was a Hungarian-born neuropathologist who worked for the Goethe University in Frankfurt for 14 years until he was fired in 1933 for being Jewish. After his -- and other scholars' -- dismissal, he convinced the then decade-old modern Turkish Republic to admit persecuted German professors to positions at Turkish universities. Mustafa Kemal Ataturk, the secular founder of the Turkish state, enthusiastically agreed to Schwartz's proposal. Turkey quickly admitted 150 German Jewish professors. Schwartz was appointed as director of the Department of Pathology at the University of Istanbul. More than seven decades after, a German initiative that bears Schwartz's name is returning the favor. In the first week of 2017, another 631 Turkish researchers and professors were dismissed from their universities, adding to thousands who were purged during the second half of 2016. Several Turkish scholars are now reversing Schwartz's path: In the fall of 2016, the Philipp Schwartz Initiative received more applications from Turkey than war-torn Syria or any other country. Turks now account for 46% of all applicants worldwide. As the Brussels-based European affairs weekly newspaper Politico put it: "Turkey loses its brains." Turkey's problem is bigger than just literally losing its brains. The country apparently is also figuratively losing its brains. News headlines are so confusing that often one cannot decide whether he is reading a real newspaper or the Turkish version of The Onion, reflecting a collective, socio-pathological frenzy -- ironically Schwartz's work of science. 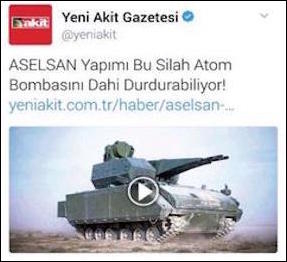 An Islamist and militantly pro-Erdogan newspaper, Yeni Akit, ran the photo of what looks like a main battle tank, claiming that this weapons system had been developed by Aselsan, a state-controlled defense company, and was capable of "even stopping an atomic bomb." Yeni Akitbelongs to an "elite" group of media outlets whose editors often find a seat aboard Erdogan's private jet when he travels abroad for state visits. What is more worrying than the absurdity of Yeni Akit's claim is that few Turks would question the story's authenticity. Erdogan-mania can take other weird forms, too. Another news story recently revealed that a legal investigation has been launched into 18 residents of a small village in southern Turkey, after the village headman informed authorities that the men engaged in "terrorist activity" and insulted President Recep Tayyip Erdogan. It became clear that the 18 suspects were merely the village headman's election rival and his relatives and friends. The village headman's behavior can be explained by "human psychology and political greed." What makes Turkey look more like North Korea than a European democracy is the legal authorities' reflex to launch probes into anyone accused, without evidence, of terrorist activity or insulting the president. In Turkey, village headmen, like most villagers in Anatolia, are generally known to be Erdogan loyalists. After the Turkish lira's unprecedented depreciation against major currencies since the beginning of 2017, the president blamed the slide on "manipulators and terrorists" who keep foreign currency portfolios. "There is no difference between a terrorist who has a weapon or bomb in his hand and a terrorist who has dollars, euros and interest rates in terms of aim," Erdogan said on January 12. In a show of support for Erdogan, a group of village headmen in Turkey's southeastern city of Adiyaman burned stacks of one dollar bills, protesting the U.S. currency's sharp rise against the lira. Nice show. But the angry village chiefs were not generous enough in expressing their wrath for the dollar: During their show, they burned fake dollar bills. Elsewhere, the headline "Top press rights defender in Turkish court for terror propaganda" was another Turkish peculiarity. Erol Onderoglu, the Turkey representative for Reporters Without Borders, along with rights activist Sebnem Fincanci and journalist Ahmet Nesin, has been charged with "making pro-Kurdish terror propaganda and aiding terrorists," risking years in prison. The indictment proposes as evidence only the fact that the suspects had guest-edited a pro-Kurdish newspaper after its editors were put in prison. On January 16, Turks sighed with relief when, after a 16-day manhunt, Turkish police caught the jihadi terrorist who gunned down and killed 39 people at an upscale nightclub in Istanbul shortly after midnight on New Year's Eve. The man was caught alive in a special-forces operation, together with an Iraqi man and three women from Somalia, Senegal and Egypt -- all believed to be members or supporters of the Islamic State of Iraq and Syria (ISIS). He confessed to the attack, and his fingerprints matched with those at the scene of crime. His four-year-old son was missing from the safe-house where he and others were caught. The poor toddler is believed to have been sent to another safe-house in Istanbul. Wherever he is being kept, he will never have a safe life in Turkey despite his innocence. The Turks treat him as a terrorist in absentia. Cemil Barlas, a pro-Erdogan journalist, tweeted that "... in whatever way he should be used [implying torture], that child should be used to make the killer talk. There is no moral harm in that."